These paleo blueberry scones couldn’t be any simpler to put together and can be easily adapted to the season! 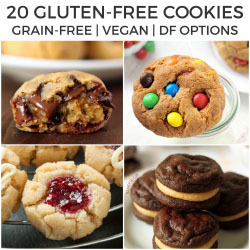 They’re also grain-free, gluten-free, and dairy-free. Are you here for pumpkin recipes? I hope not. It’s still summer, y’all! :D Come September, I’ll be posting an insane amount of apple recipes. Until then, I intend on squeezing every bit of joy out of summer. I think things are maybe a little different when you have a wonderful thing called California producing delicious fruit year-round. Over here, it’s pretty much apples, oranges and bananas throughout the winter. It gets quite boring. These gluten-free blueberry scones, which I posted over on My Baking Addiction earlier today, don’t even use fresh blueberries so really, you could make these at any time during the year but fresh blueberries work just as well. Just be careful when adding them into the dough. I only went with dried blueberries because I enjoyed the crunchy bits! If blueberries aren’t your thing, toss in whatever dryish add-ins you want (so not frozen soggy berries!) Think chocolate chips, dried fruit or nuts. If you’ve never had grain-free scones before I feel like I should warn you that these aren’t the buttery and flaky kind of traditional scone you’re probably used to. But they are delightful! I made these for a brunch and there wasn’t a single, “What is this? !” comment. Berliners are very direct and believe me – they’d have said something. Preheat oven to 350 °F (175 °C) and line a baking sheet with a piece of parchment paper. In a medium mixing bowl, stir together the eggs, maple syrup, lemon extract, and vanilla extract. Set aside. In another medium mixing bowl, stir together the blanched almond flour, coconut flour, sugar, baking soda, baking powder and salt. Stir the dry mixture into the wet until well combined but do not over mix. Fold in the dried blueberries. Form discs of dough approximately 2" wide and 1" high. If using, place the flaked almonds on a small plate and roll the tops and sides of the discs in the almonds. Alternatively, sprinkle the tops of the scones with coarse sugar. Place the scones 2" apart on the prepared baking sheet and bake for 15-17 minutes or until the outside of the scones are firm and lightly browned. Let cool for 2 minutes on the baking sheet and then remove to a wire rack to cool completely. Store in an airtight container for up to 2 days. They'll become a little moister the longer they sit. 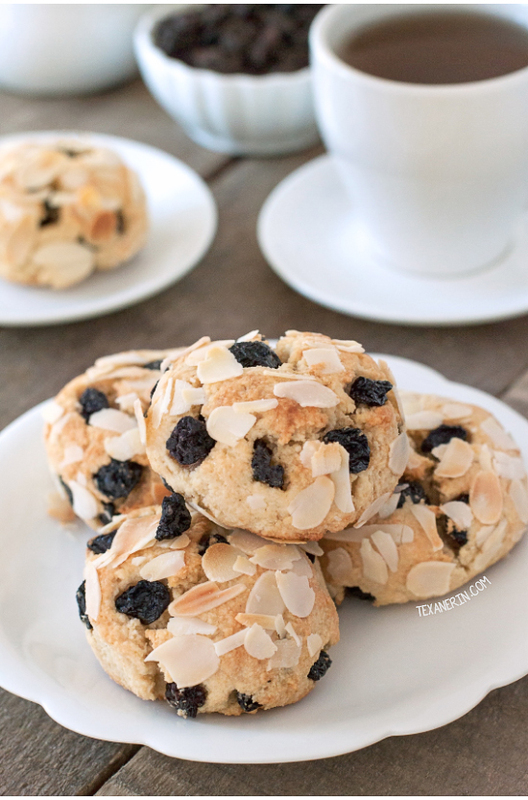 36 comments on “Paleo Blueberry Scones (grain-free, gluten-free, dairy-free)” — Add one! Yum! 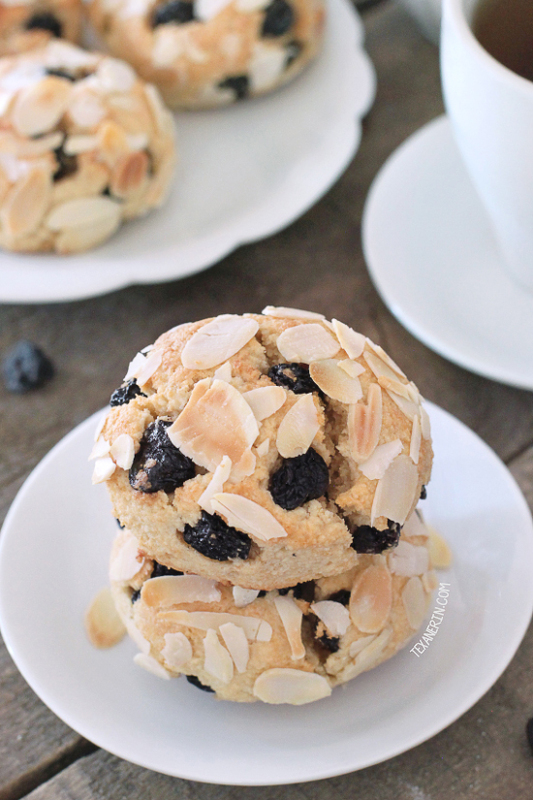 I bet the subtle almond flavour and blueberries are such a beautiful pairing in these scones! I’m very excited to try these scones soon! How cute are your scones?! What a great idea for a snack! In Dallas, I suggest you go for Venezuelan food. Zaguan is my favorite. La Duni is also good (fancier and more expensive). Meso Maya is good Mexican food. Thank you for sticking with summertime fruits right now. I just can’t do pumpkin yet! The texture of these look wonderful and I’m so curious to try them (it sounds as though they got the thumbs-up from your Berliner guests). Right?! I don’t get it. Even if it’s cooler in some areas… it’s just August! Oh have fun in New Orleans!That’s on my bucket list…just to eat (and drink) my way through it! When Top Chef was filmed there…I was salivating every episode! I am not ready for pumpkin yet! 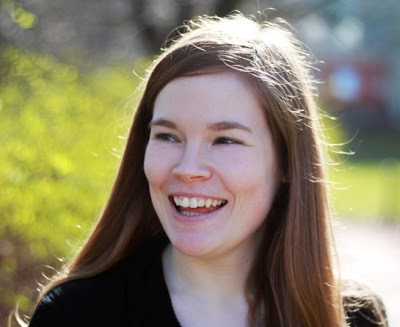 Ask me in a month and I am sure I will tell you something different! these scones look good enough to eat with my coffee! And hope you have a great time when you hit state side again! I have so many places I want to visit, and I’d love to go to Poland…and New Orleans for that matter. And I have been craving scones like a madman lately, so I’d be up for trying them, typical or not. 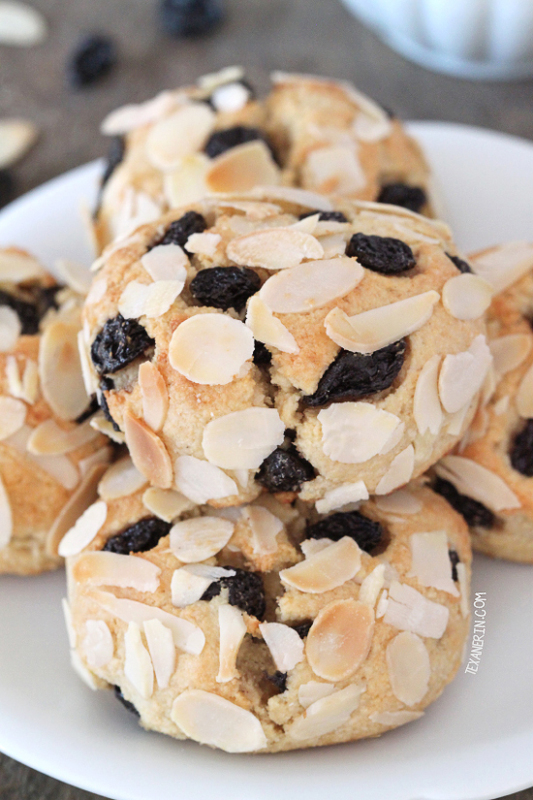 I’ve made scones with almond flour before and they came out very nice, so I’m betting these would be great. When you’re in Savannah, if you like craft beer, try Moon River Brewing. We had dinner with beer there several years ago and really enjoyed it. Hope you enjoy coming home to visit. These really look yummy. I have never cared for fresh blueberries. Just too tart for me. I can see these dried ones being really good in this. I just made carrot, zucchini, and coconut almond flour muffins yesterday. Was hoping my great granddaughter would like them. They are trying her on GF foods right now. Very hard for a 3 year old too. Thanks!! I will check these out. Love peach and blueberry together! These scones look fantastic! I’m so NOT ready for pumpkin yet so I’m very happy seeing these blueberry scones today! Love it. What a great looking scone! I’m pretty much a fan of all things blueberry because how can you not eat your weight in blueberries during the summer? I agree about it still being summer but there is a tiny part of me that is excited to bake with apples and sip pumpkin spice lattes…haha. This sounds wonderful. Enjoy your trips! !